CrisisRus is a LaptopsRus project scheduled for 2013-2015. LaptopsRus is a self-organized open-participatory platform engaged in networking woman live performers. In Spring 2009, laptopsRus launched "MEETING | REUNIÓN", bringing woman live performers for open public meeting/performance set inside an electronically updated boxing ring. 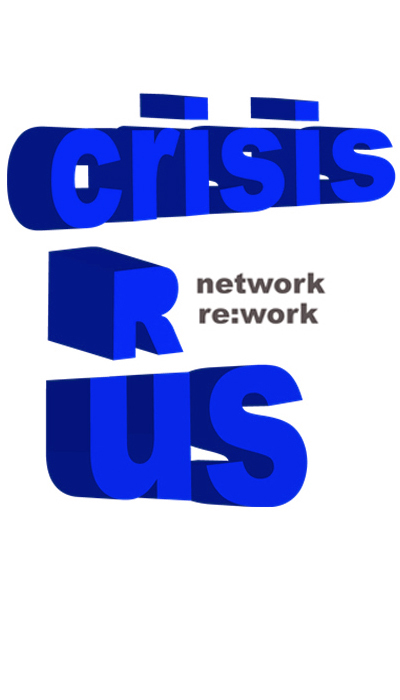 Prompted by the prolonging economic crisis as manifested in global Cacerolazo (dubbed global noise) of massive street protests with pots and pans, we launch CrisisRus "NETWORK | RE:WORK" in 2013. We want to acknowledge woman work force and resilient capacity in these time of personal and general crisis. "NETWORK | RE:WORK" is conceived as an online and offline Cacerolazo live performance with woman performers, homemakers, nomads, artists, activists across north-south continents and east-west hemisphere. Combining network streams of audiovisual materials with local perspectives in addressing issues of concerns, the CrisisRus live performance remixes slogans, signals, noise and visuals in AV manifestation.